Home › Blood Sugar › Have a Hunger to Stop Eating Sweets? Do you find yourself reaching for a sweet treat after meals? Do you find these cravings often happen at about the same time each day or month? People experience sugar cravings for reasons such as poor diet, lack of sleep, stress, getting out of the “regular” meal habits, carbohydrate-heavy meals, or even a consistent indulgence that has programmed the brain over time. As hard as it is to pass up a sale at your favorite shop, sugar cravings can be even more powerful. Fortunately, there are natural methods that can make it easier to resist. What are sugar cravings, and why do we get them? We get energy from the food we eat – and the easiest energy production for the body comes mainly from foods rich in carbohydrates, like bread, pasta, potatoes, fruit, dairy, vegetables, nuts, and yes — sugary snacks. The body converts the carbs to glucose. Simple carbs, which are the foods that taste sweet, are those that convert quickly and are absorbed efficiently into glucose. Complex carbs, which often contain starch and fiber, take longer to convert into glucose. Insulin is a hormone that moves glucose from the blood into the cells for energy. After the body uses the energy it needs, leftover glucose is stored in bundles called glycogen in the liver and muscles. Glucose can be stored in fat cells, too. Under normal circumstances, the body’s blood sugar increases after eating. During the times between meals, stored glucose is retrieved so that the blood glucose levels remain relatively constant. Sugar cravings are strong, consistent urges to eat simple carbs, which includes sweets – often times in excessive quantities. Routinely desiring such carbs might be your body’s way of sending you a warning message of an unhealthy routine or lifestyle. When the brain forms a routine, it can be very difficult to break the cycle – partly because of the hormones released and the emotions that are associated with past experiences. For example, eating ice cream in the summer may give you nostalgia for the past and bring feelings of happiness. As a result, having that first bite of ice cream, or even just thinking about ice cream, can increase levels of dopamine (often known as the “feel good hormone”) and serotonin (”mood stabilizer hormone”). A number of scientific articles, such as one published in Neuroscience & Biobehavioral Reviews, relate the changes in the brain that occur with sugar “addiction” to those that occur with addictive drug use. Ongoing stress plays a role in sugar cravings. Stress increases your cortisol levels — a hormone that prepares the body for the fight or flight response by tapping into the glycogen stores and converting them to glucose. The flood of glucose for muscle use results in the body craving more sugar to replenish the stores. A study published in Psychoneuroendocriology demonstrated a direct association between cortisol, created by stress, and consumption of sweet or high-fat food in women. The brain often plays a difficult-to-avoid, biological part in undermining our willpower — but there may be foods you eat regularly that increase your cravings for sugary foods. For example, eating a diet high in simple carbohydrates can cause blood sugar levels to spike and then crash. After the crash, the body usually looks for another quick energy boost; typically through more simple carbohydrates. The cycle repeats and leaves one feeling longing for sugar just to keep energy levels up. Since protein (along with fat) slows the rate at which sugar is released into the bloodstream, a high-protein diet can stabilize blood sugar levels and prevent the kind of swings that lead to sugar cravings. Many studies have explored this concept, including one published in Nutrition Journal. This study, focused on overweight women, compared the calories consumed after eating a high-protein breakfast versus a low-protein one. Though the high-protein breakfast wasn’t even a high-quality one, it drastically reduced the number of calories the subjects ate at lunch. But low protein intake isn’t the only aspect of your diet that may be contributing to an overindulgence in sugar and carbohydrates. When artificial sweeteners were invented, it was thought that these would make people healthier because sweet treats would be lower in calories without all the sugar. Unfortunately, artificial sweeteners appear to actually make sugar consumption even higher. Many studies, including one from the Yale Journal of Biology and Medicine, indicate that most people still have the same cravings for the same high-sugar (and usually high-calorie) snacks when eating foods or drinking beverages with artificial sweeteners – and some people even eat more sugar than they otherwise would have. Some researchers believe this is because a lack of complete satisfaction leads the brain to engage in further food-seeking behavior. Not getting the regular number of calories in the diet also creates sugar cravings. The body starts looking for fuel as a way to catch up when calories are reduced. It’s no wonder that the first day of a reduced-calorie diet ends as quickly as it starts with a sugary snack. Poor sleeping habits appear to lead to sugar cravings. A number of studies, such as one published in Nature Communications, have shown poor sleep can reduce the functioning of the brain and send messages to the body to seek out high-calorie foods like sugary treats simply to have enough glucose in the blood stream to keep it awake. Disrupting your “biological clock” is a common reason for sugar cravings. Many women experience intense cravings a week or two before their periods. Scientists believe changes in progesterone and estrogen levels generate a drop in blood sugar which leads to sugar cravings. Another cause may be low serotonin levels which are generally lower during PMS. These calendar cravings don’t have to result in wolfing down a bag of M&Ms – there are better diet solutions. For people with diabetes, sugar cravings are particularly problematic. People with diabetes often have enough sugar, but the cells can’t use the sugar; either because it doesn’t have sufficient insulin or the cells are not responding properly to insulin. As a result, the brain isn’t getting the sugar it needs and naturally craves more. Most people with sugar cravings don’t have diabetes, but it is worth looking into if you have a family history of it or if you have tried other solutions and still feel the constant need to eat sugary treats for energy. What are natural ways to reduce sugar cravings? 1. Recognize when you are forming bad habits and to pick a more positive activity instead. 2. Some people find drinking a glass of water instead of indulging in sugar to be effective. 3. To better regulate blood sugar levels and have an easier time resisting sweets, eat more foods that are rich in proteins and fats. Start your morning meal off predominantly with healthy proteins and fats and minimize the carbs. This helps to regulate your blood sugar and insulin levels. 4. Eat 6 mini-meals throughout the day, every 3 hours, instead of three big ones – this helps regulate the blood sugar levels. 5. Avoid simple carbohydrates as well as products that contain artificial sweeteners. 6. Choose complex fiber-rich carbohydrates. The body needs carbs since they break down easily into glucose needed for energy, but complex carbohydrates break down slower – brown rice instead of white rice, baked potatoes instead of French fries, fruits, nuts, and vegetables instead of cakes and Danishes. 7. Make sure you get high-quality, consistent, restful sleep. Consider using an eye mask or white noise machine if distractions are interfering with your rest, and prioritize going to bed and waking up each day at the same time to avoid throwing off your internal clock. 8. Find ways to boost serotonin that aren’t related to sugar. Get outdoors in the sunshine – the lack of sun can reduce serotonin levels. Eating cheese, eggs, and walnuts, and exercising more are all commonly-cited, effective ways for most people to boost serotonin levels in a healthier way. Some causes for sugar cravings can be addressed by supplementing with certain natural products. If you suspect that bad sleep is the culprit, read my previous article “Which Natural Sleep Aid is Right for You” Depending on why you’re sleeping poorly, supplements like 5-HTP and melatonin may help as well. For those who feel stress may play a role in their sugar cravings, supplementing with valerian can be effective. BMC Complementary and Alternative Medicine published a recent study that showed valerian root extracts can suppress physical and psychological stress. A study from Journal of Pharmacy and Bioallied Sciences found that valerian use is effective in preventing depression-like behavior. A high-potency valerian supplement like Valerian Root, by Vital Nutrients, is a good place to start. For those seeking to conveniently increase the protein in their diet – which has been shown to reduce cravings, a high-quality whey protein supplement like WheyBasics by Pure Encapsulations is an excellent choice. I suggest reading “Which Protein is the Best Fit for You” to find the protein that works for your own personal health needs and dietary choices. Although there is not significant high-quality scientific research to verify their effectiveness, certain B vitamins (such as biotin and riboflavin), gymnema sylvestre, cinnamon bark, curcumin and chromium picolinate are also popular natural remedies for sugar cravings. 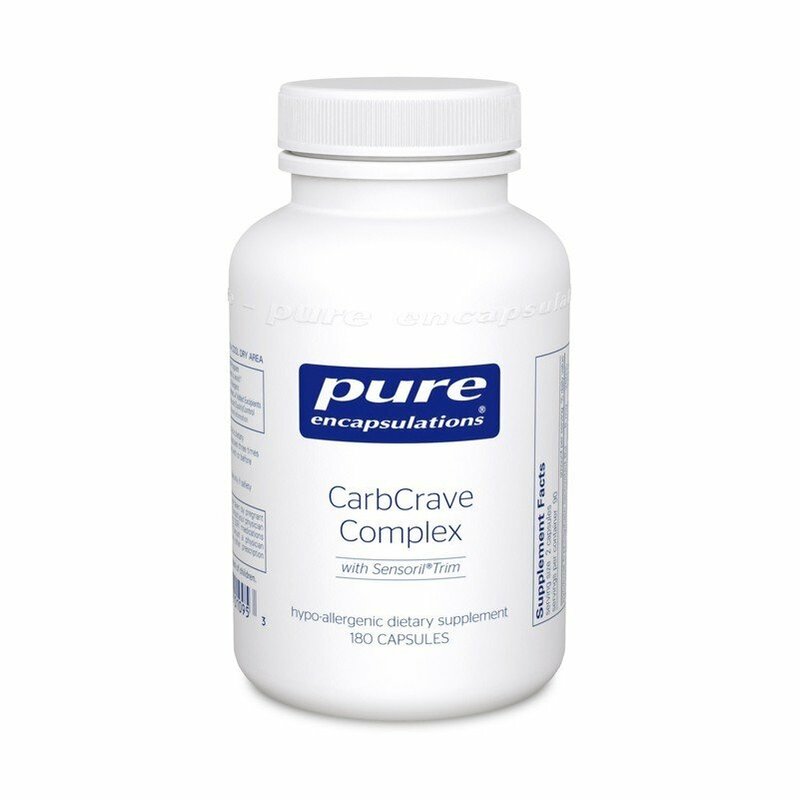 A good combination product with some of these natural supplements is CarbCrave Complex by Pure Encapsulations. I also suggest Chromium Picolinate by Thorne because science has long established a relationship between chromium picolinate found in brewer’s yeast and glucose metabolism. Also, there are some studies that suggest chromium decreases cortisol, which is important because of the relationship of cortisol and sugar cravings — as previously mentioned. If your sugar cravings don’t improve with these steps, talk to your doctor. It’s possible that they may stem from an undiagnosed condition that needs medical attention. I hope this information helps you resist those sugar cravings and take action to address their root causes. If you have any questions regarding the concepts discussed here or anything else, you can reach our customer service team at: customerservice@oakwaynaturals.com or you can call them at 888-460-3091. A unique complex of natural ingredients to assist with dietary carb reduction. We get energy from the food we eat – and the easiest energy production for the body comes mainly from foods rich in carbohydrates, like bread, pasta, potatoes, fruit, dairy, vegetables, nuts, and yes — sugary snacks. The body converts the carbs to glucose. Under normal circumstances, the body’s blood sugar increases after eating. During the times between meals, stored glucose is retrieved so that the blood glucose levels remain relatively constant. When the brain forms a routine, it can be very difficult to break the cycle – partly because of the hormones released and the emotions that are associated with past experiences. A number of scientific articles, such as one published in Neuroscience & Biobehavioral Reviews, relate the changes in the brain that occur with sugar “addiction” to those that occur with addictive drug use. Since protein (along with fat) slows the rate at which sugar is released into the bloodstream, a high-protein diet can stabilize blood sugar levels and prevent the kind of swings that lead to sugar cravings. But low protein intake isn’t the only aspect of your diet that may be contributing to an overindulgence in sugar and carbohydrates. When artificial sweeteners were invented, it was thought that these would make people healthier because sweet treats would be lower in calories without all the sugar. Unfortunately, artificial sweeteners appear to actually make sugar consumption even higher. Many studies indicate that most people still have the same cravings for the same high-sugar (and usually high-calorie) snacks when eating foods or drinking beverages with artificial sweeteners – and some people even eat more sugar than they otherwise would have. Some researchers believe this is because a lack of complete satisfaction leads the brain to engage in further food-seeking behavior. Not getting the regular number of calories in the diet also creates sugar cravings. The body starts looking for fuel as a way to catch up when calories are reduced. Poor sleeping habits appear to lead to sugar cravings. A number of studies have shown poor sleep can reduce the functioning of the brain and send messages to the body to seek out high-calorie foods like sugary treats simply to have enough glucose in the blood stream to keep it awake. Disrupting your “biological clock” is a common reason for sugar cravings. Many women experience intense cravings a week or two before their periods. Scientists believe changes in progesterone and estrogen levels generate a drop in blood sugar which leads to sugar cravings. For people with diabetes, sugar cravings are particularly problematic. People with diabetes often have enough sugar, but the cells can’t use the sugar; either because it doesn’t have sufficient insulin or the cells are not responding properly to insulin. As a result, the brain isn’t getting the sugar it needs and naturally craves more. 7. Make sure you get high-quality, consistent, restful sleep to avoid throwing off your internal clock. 5-HTP and melatonin may help if poor sleep is the culprit. Valerian has been shown to help reduce stress, and a high-quality protein supplement can help increase protein levels and feelings of fullness. Although there is not significant high-quality scientific research to verify their effectiveness, certain B vitamins (such as biotin and riboflavin), gymnema sylvestre, cinnamon bark, curcumin and chromium picolinate are also popular natural remedies for sugar cravings. A good combination product with some of these natural ingredients is CarbCrave Complex by Pure Encapsulations. I also suggest Chromium Picolinate by Thorne because science has long established a relationship between chromium picolinate found in brewer’s yeast and glucose metabolism. If your sugar cravings don’t improve with these steps, talk to your doctor. It’s possible that they may stem from an undiagnosed condition that needs medical attention. I hope this information helps you resist those sugar cravings and take action to address their root causes. If you have any questions regarding the concepts discussed here or anything else, please feel free to fill out our Ask the Doctor form found at the Doctors Corner. Epel E, et al., Stress may add bite to appetite in women: A laboratory study of stress-induced cortisol and eating behavior: Psychoneuroendocrinology. 2001. Yang Q., Gain weight by “going diet?” Artificial sweeteners and the neurobiology of sugar cravings: Yale Journal of Biology and Medicine 2010.